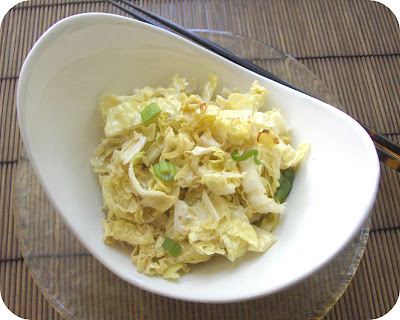 I was first introduced to Chinese cabbage salad at a church potluck. And where there's a church potluck, there's good food and recipes. This salad is no exception. It's a dish that's tasty, easy and inexpensive to make. Try it out and tell me what you think. Directions below. 1. Thinly slice the napa cabbage. Chop green onions. Mix together and set aside. 2. Crush the top ramen into bite size pieces while it's still in the bag. Remove the seasoning packets. 3. Saute the almonds, sesame seeds and top ramen (uncooked) in the butter and oil til lightly browned . Take off heat and mix in seasoning packets. Set aside. 4. Mix all the dressing ingredients together until well blended. I usually add everything into a jar and shake it up. Often I only use half of the dressing but it all depends on taste. 5. Mix dressing, cabbage mix, and top ramen mix all together. Serve immediately. *If you plan on bringing this to a potluck, mix everything except the ramen mixture. Add that last when ready to serve. Otherwise, the ramen noodles will get soggy. *Add cooked chicken chunks to make a hearty salad for lunch or dinner. I'm going to try this w/o the Ramen (South Beach for me)...thanks for the recipe. Your recipe looks absolutely delish and healthy! Can't wait to try it! This sounds fantastic, but I don't think there's any substitute for Napa cabbage! :0) It's my fave. Thanks for the recipe, just perfect for summer. We've been eating this stuff for years and it is awesome! It makes a bunch and I usually eat on it for a week! The best part is my daughter and fiance hate it, so it's all mine! I add tiny salad shrimp or diced chicken to it as well! I have made this recipe many times before. I first saw the recipe on Paula Deen's cooking show. Except, instead of napa cabbage, she used broccoli slaw, which you can buy pre-packaged at the supermarket. really delicious, I'll try it with napa next time. Thank you so much for this recipe....I have been searching for one just like it for so long. My best friend from college made this and I loved it so much. YAY! Now all I need is some Napa Cabbage! This is a new way of making cabbage salad, a must try! Thanks! This is a fav. at our place, less the ramen. It is such an easy throw together recipe but truy is delicious - fresh, light and flavoursome. The cabbage part tasted great but the noodles I bought was unfortunately a bit salty, should've used only one package seasoning. I'd like to try this again. Thanks for the recipe! This looks very fresh and interesting. I must give it a try. Looks delish...I hope to make this soon!!!! As always, thanks for your wonderful creations! I tried this today and it was a delicious and fresh salad. I imagine I can use Baby Star ramen-style snacks, too.